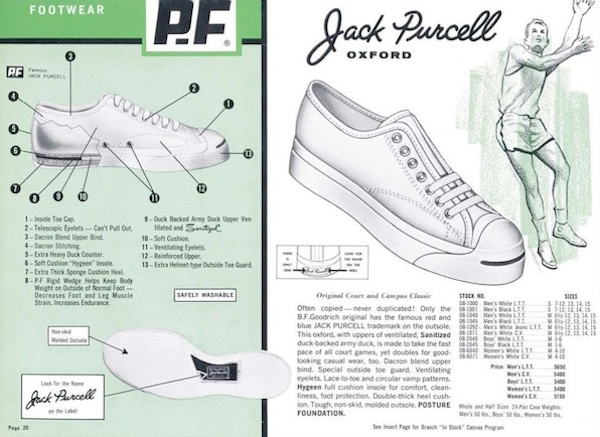 Jack Purcell, 84, said in an interview from his Toronto home that the sturdy sneaker was revolutionary at a time when "blisters and sore heels and turned ankles were the order of the day." 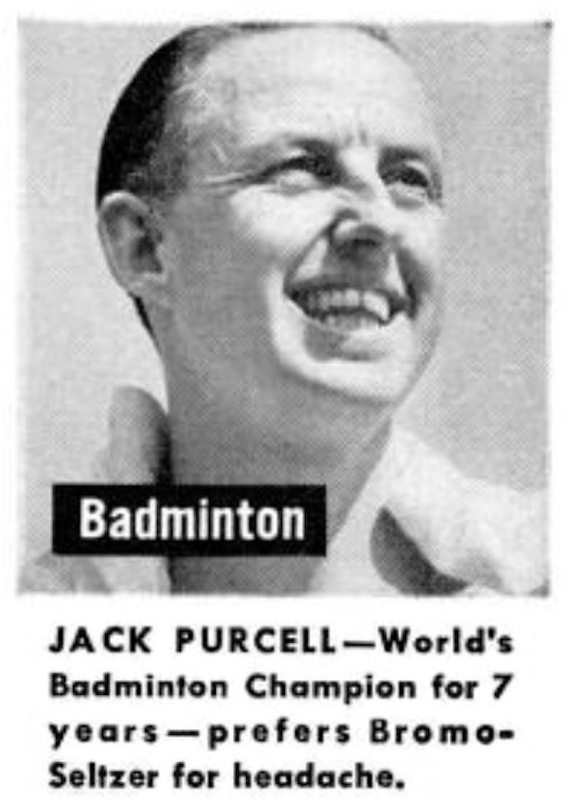 "It's almost identical to what it was back in the '30s," said Purcell, a semi-retired stockbroker who first won the world badminton championship in 1932. "Basically it was a soundly engineered product right from the start. It's still a very comfortable item," he added. "I'm wearing a pair right now." The PF in our name stands for that extra help: Posture Foundation. And only PF Flyers have it. The posture Foundation is a rigid rubber wedge built inside each heel. It helps a kid to carry himself correctly, by shifting his body weight to the outside of each foot. So, his weight is better distributed over each foot. My present arch is designed to adapt itself to the sensitive area referred to while still continuing to effect a supporting and rotating action upon the general arch of the foot. 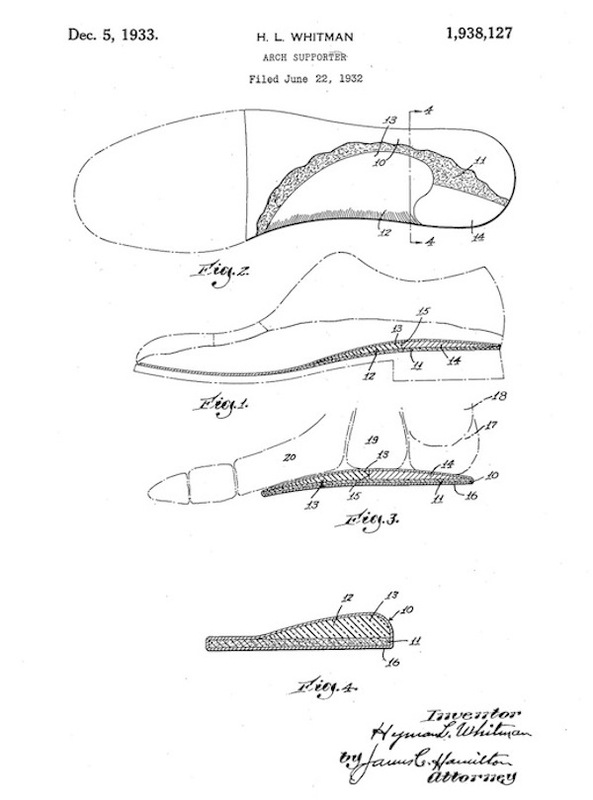 The principal object of my invention is therefore an improved arch supporter for use in tennis shoes, leather shoes and like forms of footwear. The B.F. Goodrich Company announced Tuesday that it would stop manufacturing and marketing footwear — an estimated $100 million a year business. Goodrich is a major American producer of rubber and canvas footwear under the P.F Flyers brand for athletic sneakers and golf shoes, the Jack Purcell Brand for tennis sneakers and the Bootinos brand for vinyl women's boots. According to trade sources, the footwear division accounted for about 10 per cent of the big tire and rubber and producer's volume last year. 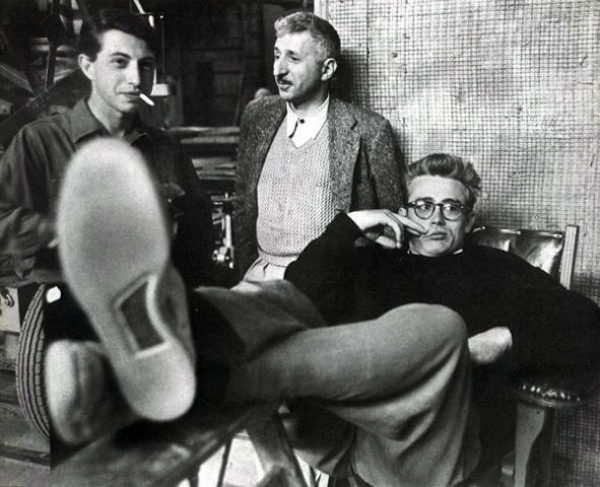 The B.F. Goodrich Footwear division was bought in 1972 by the New York-based Eltra Corporation whose most recent acquisition was B. F. Goodrich's footwear arch-enemy Converse. 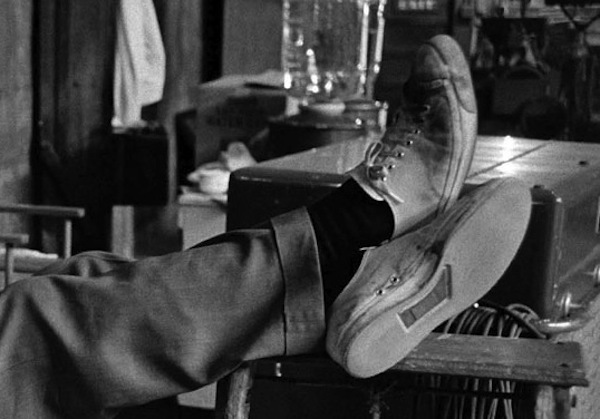 In other words: Jack Purcells and Chuck Taylors were manufactured, until 2001, under the same roof, a factory in Lumberton, North Carolina. 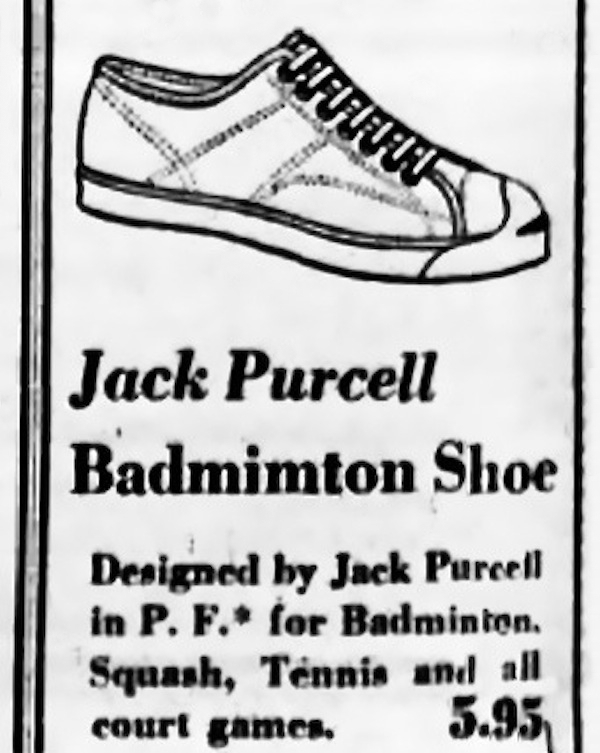 By the end of the decade (1970s), Converse was selling just 50,000 Jack Purcells a year, and doing no promotion for the shoe. 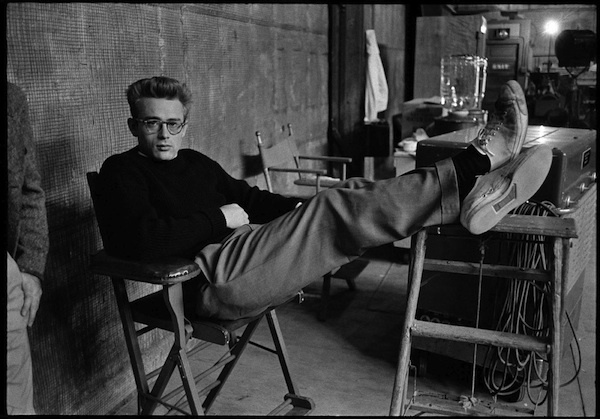 Then the company's tennis marketing manager, walking in Harvard Square two years ago, spotted a 1955 poster of James Dean looking vaguely beat generation as he lounged on a movie set in chinos and T-shirt. 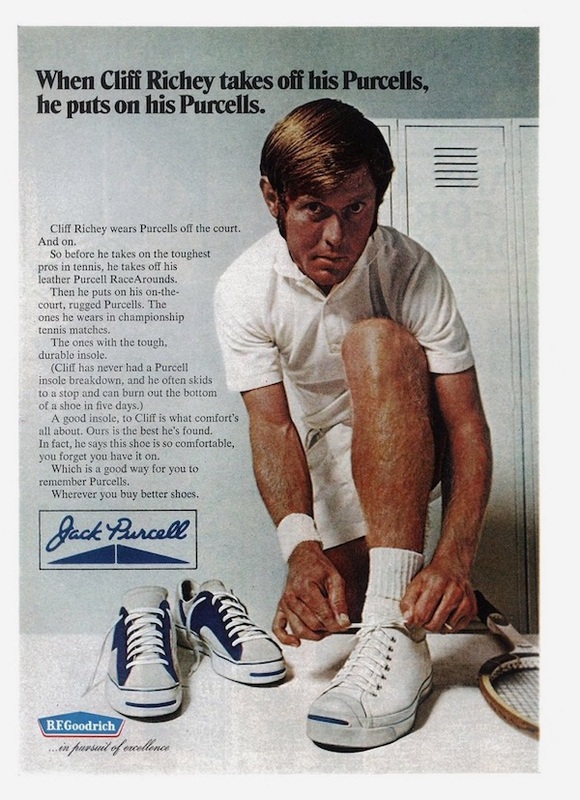 "Lo and behold, he had on a pair of Jack Purcells," said Lou Nagy, Converse's marketing communications director. 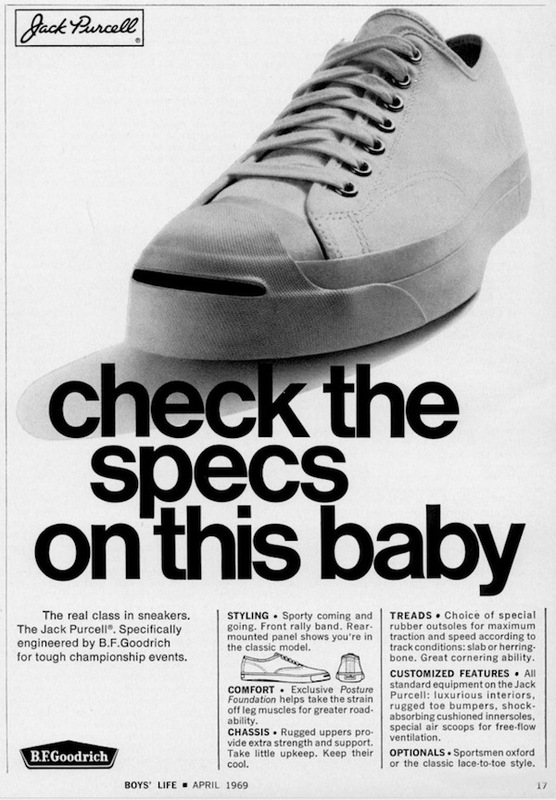 The company this year shaped a $500,000 advertising campaign around the poster, promoting the Jack Purcell in magazines such as Esquire, GQ and The New Yorker.